Is there anybody have any experience about XUP (Xilinx University Program) USB-JTAG Programmer Revision-G using with Vivado 2015 or 2018? I have some little experience with Vivado 2015.5 and 2018.1 but regarding my experiences XUP USB-JTAG Programmer is not compatible with Vivado? I tried all ways on Centos-7 OS and the particular script (install_drivers.tar.gz). I aimed to program the Zedboard for petalinux applications developing but no success with XUP USB-JTAG Rev.G and Vivado running on Centos-7. Could you please share any suggestions if you have? Let me know how this goes for you. I am finding out some for information about this; I will let you know when I find out more details, though my initial gut reaction is that if the XUP USB JTAG programmer is based off of the Platform Cable USB (the original as opposed to Platform Cable USB ii), it may not be able to detect Xilinx's Zynq and 7-series devices. I am finding out for certain though. Thank you very much @JColvin for your kindly regards. I will be interst in your quote. The modules that we had locally at the office weren't reliably working so we have requested a new one to be sent so we can get some accurate information about it. How is your time progress? Will new XUP USB JTAG come to you in a short term or long term? Shall I wait your investigation? If the module did not arrive this past Friday (June 8th), I would expect that it should arrive in our office in the by June 13th at the latest, though to be fair, like other things, we don't have have control if there are any shipping delays, but I am hoping this will not be the case. The module arrived yesterday afternoon. Our design engineer was able to get it to detect and program Zynq and other 7-series devices on a Windows 7 machine, but was not able to get it working as of yet on a Windows 10 machine. I will ask about Linux systems as well, though I do not know if they have any distribution readily available to them or not. Is there any update about XUP USB JTAG debugger as well on Linux systems? Did you ask about this issue to your design engineer? I apologize for the delay. Our design engineer was able to get it working in Windows 10 (the install script as part of the Xilinx installation process for the cable drivers is not working correctly), and plans on trying to get the cable drivers working in a Linux distro. I'll let you know what I find out. Our engineer was able to get the XUP cable recognized and working on a Centos 7 64-bit VM with Vivado 2018.1 without much issue. The main thing that they did (detailed in the Installing Cable Drivers section of Xilinx UG973) and went to their install_install drivers directory (../data/xicom/cable_drivers/lin64/install_script/install_drivers) and executed the ./install_drivers script as sudo. They were then able to run Vivado and use the hardware manager as normal to connect to the cable and have Vivado 2018.1 successfully auto-connect to the XUP USB JTAG cable and the downstream Zedboard. Is there a detailed driver installation instructions for Windows 10? Check out page 28 of Xilinx UG973. 1. I performed the installation cable drivers in Vivado Installer (2018.2). 2. I run install_drivers_wrapper.bat. The log file reports that everything installed without errors. @JColvin Thanks for the solution! It also works with Vivado 2018.2 and WIN 10 Home. You mentioned that on 28 June e-mail subject of "XUP USB-JTAG Programmer" on digilent forum "Our engineer was able to get the XUP cable recognized and working on a Centos 7 64-bit VM with Vivado 2018.1 without much issue." Could you please share more detail about the virtualization infrastructure for example VirtualBox or vmware? If vbox did this engineer install the virtualbox extension-pack for USB2.0 drivers recognizing? After that you simply run Vivado and use hardware manager like normal to connect to the cable. 2. 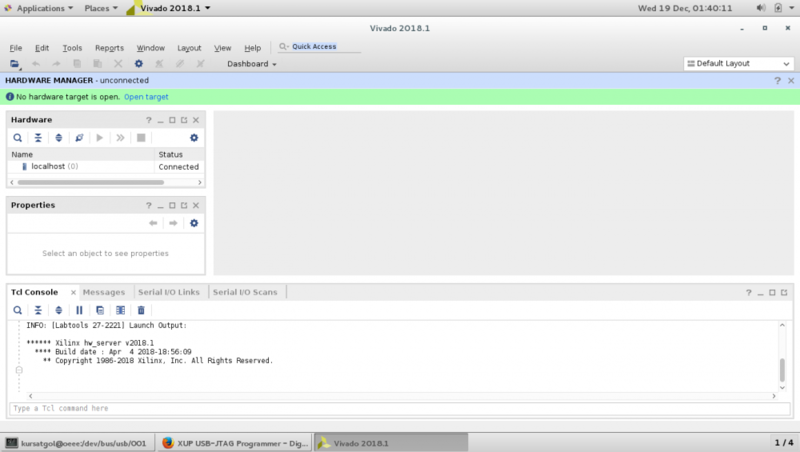 Execute “vivado” to launch the application. 3. Open hardware manager and click auto connect. Vivado 2018.1 had no problem finding and configuring the Zynq 7020 on the Zed board. I can connect to FPGA without XUP via hardware manager but i can not connect with JTAG even connect to hw_server. i added the screenshots with xup debugger and without xup debugger. How can you solve your problem on this track? My problem is very similar with yours. Could you please help me urgently? I suspect @Edwardz followed these instructions for their Windows 10 machine. Since we haven't used VirtualBox we don't have any advice specific to that, but let me know if you have any questions. My exact question is that now i can connect via directly to FPGA without xup digilent jtag programmer on zedboard, centos vm, virtualbox and vivado 2018.1 But i couldn't connect with xup digilent jtag programmer on same parameters and conditions. 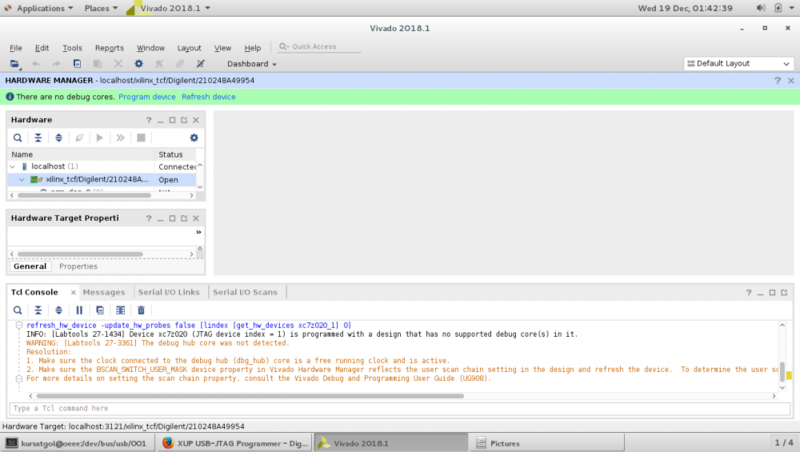 I am suspecting vivado 2018.1 is not supporting Digilent Inc. XUP (Xilinx University Program) JTAG debugger-programmer? Am i right or wrong on my suspicious? Based on the previous posts provided in this thread, Vivado 2018.1 does correctly support the XUP USB-JTAG Programming Cable. The problem is that the Xilinx installer for the cable drivers (at least for Windows 10) does not work correctly, so those drivers needed to be deleted and manually installed in order to work correctly. On Linux based systems the cable drivers are not installed automatically so you have to manually install them yourself through a series of commands (as described in Xilinx's UG973). If you have already done those steps, we (Digilent) do not have any other advice as to what you can try aside since we do not offer any formal support for getting devices to work in vitual machines; the engineer I mentioned before only happened to try VMware since they already had it installed and it worked for them when they followed the installation instructions from Xilinx documentation. I'm sorry I couldn't be of more help. I tried with fedora 20 64 bit and ISE-DS 14.6 version. Everything was fine for zedboard and also additionally NetFPGA-1G-CML boards. I still think Digilent XUP debugger is not compliant for Vivado 2018.1. Could you please share any screenshots about installation drivers or running xup debugger? So i have for ISE-DS impact 14.6. Both @JColvin and our design engineer that we had reached out to about this thread are out of the office until later next week and the following week respectively. It will be a little bit of time until we are able to respond.